"I have used Brightening Moisturizer for years and love this product! It's great if you have dry skin, very moisturizing. It's light not a heavy or sticky feeling after. I use everyday!" 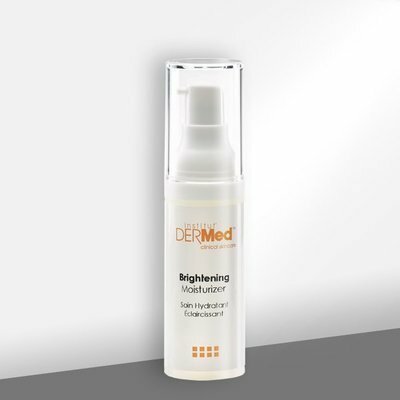 Susan S.
Even your skin tone with the Institut’ DERMed Brightening Moisturizer formulated with Oxybenzone and Sodium PCA, to hydrate for a healthy, vibrant complexion. A serious skin brightening moisturizer formulated without: hydroquinone, parabens, mineral oil, sodium lauryl sulfates, phthalates, artificial dyes or synthetic fragrances. Products not tested on animals. Smooth onto the face and other sun exposed areas with finger tips until absorbed. For best results, use twice daily, morning and evening. Clinically proven ingredients for healthy radiant skin. Sodium PCA - a high performance humectant for moisture retention. Micronized Titanium Dioxide -a reflective mineral retention. Sodium PCA - a high performance humectant for moisture. Purified Water, Octinoxate, Oxybenzone, Glycerin, Beeswax, Panthenol, Aloe Barbadensis Leaf Juice, Sodium PCA, Cocoa Butter, Sunflower Oil, Dimethicone, Carbomer, Allantoin, Octyl Palmitate, Cetyl Alcohol, Glyceryl Stearate, Potassium Stearate, Micronized Titanium Dioxide.